Romanian Scenes at Espace Culturel Louis Vuitton-Paris. 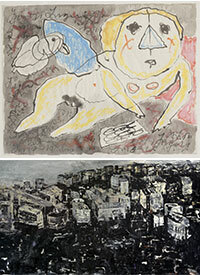 continues to explore the contemporary art scene of a foreign country since its opening in 2006. Through images as a symbol of resistance to oppression of the dictatorship of yesterday, drawings, stories, photos or dreamlike works, hyper-realistic, or abstract landscapes, contemporary scenes of everyday life in the Romanian with apparent banality, artists like Geta Bratescu, a major figure of Romanian art or Serban Savu from the new generation, confirm the existence of a pool inhabited by a real creative force, noticed in Berlin, London and New York.